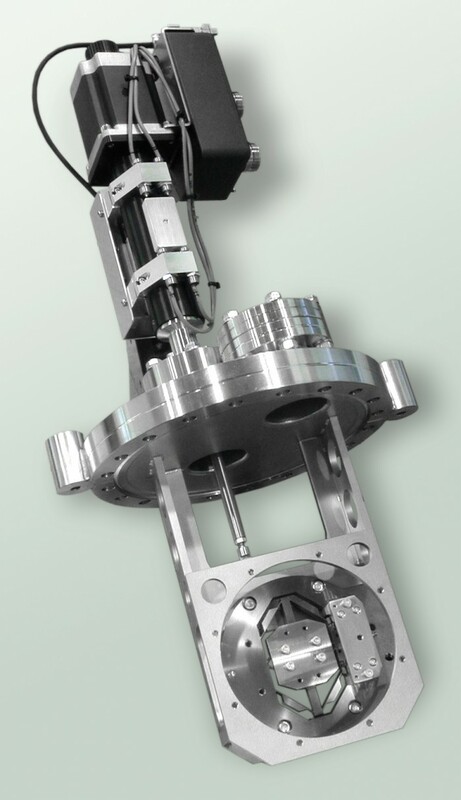 The exit slit is designed as a backlash free spring pivot system allowing a symmetricaly and exactly parallel opening and closing of the two slit jaws with one single linear precision feedthrough. It can be driven by a manual precision linear feedthrough or alternatively by a stepper-motordriven linear feedthrough with high accuracy. 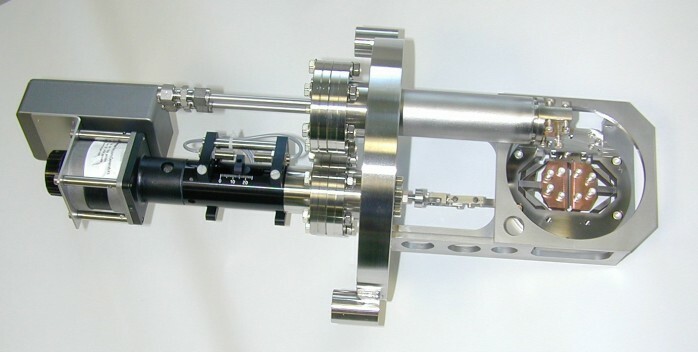 The whole slit assembly is mounted on a CF150 base flange. Outside the base flange are reference points for the alignment. 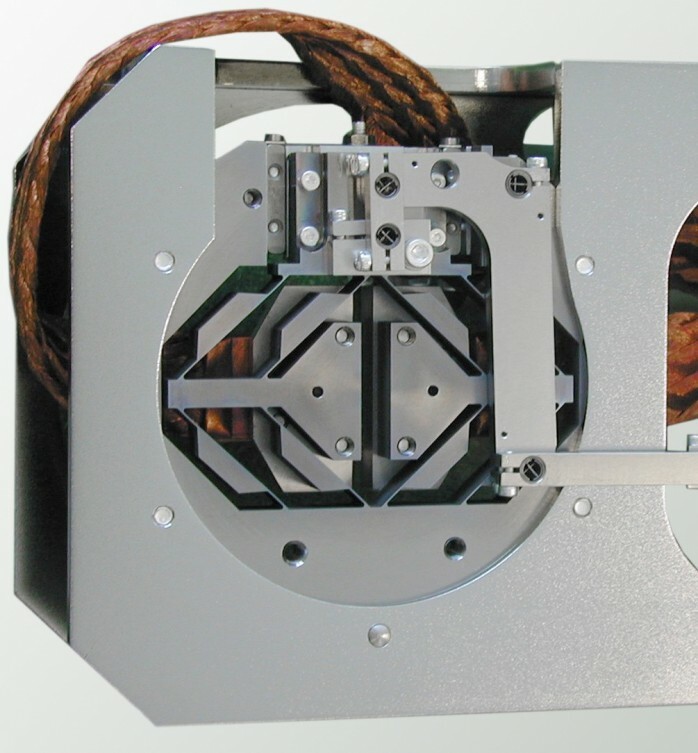 The water cooling of the slit jaws or their electrical insulation for photon current measurement are possible options. 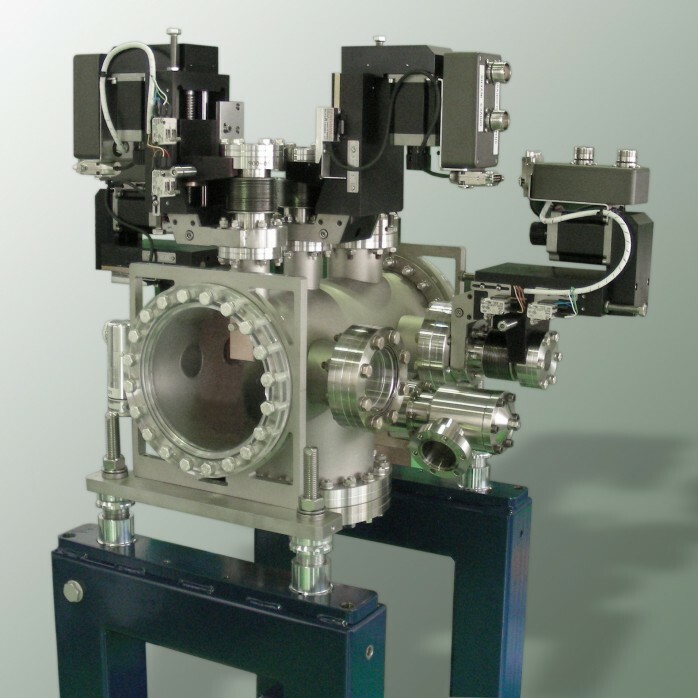 The slit chamber has a nominal size of 150CF and additional ports for a ion pump as well as flanges for e.g. view ports, fluorescent screens a.s.o.. The whole unit is mounted on a rigid steel frame support which contains elevation and lateral adjustment elements. 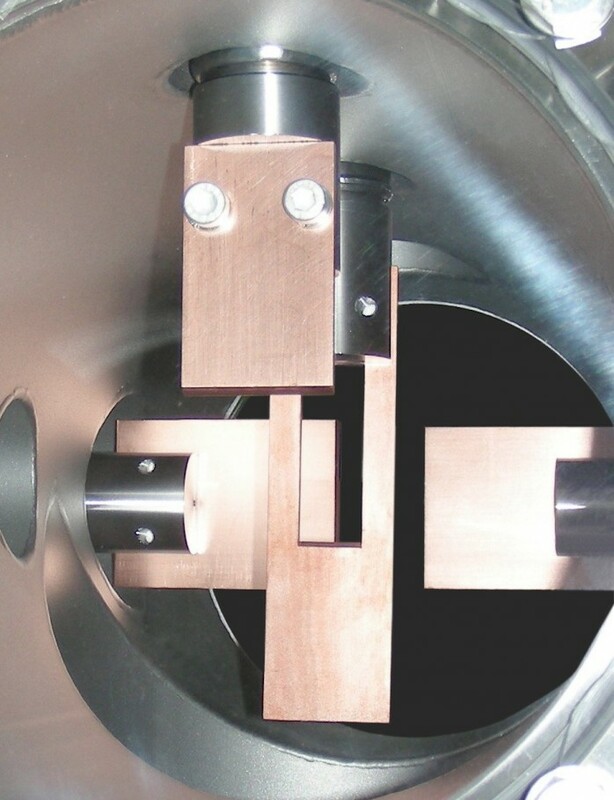 It allows a exact air-side alignment of the slit to the beam axis. 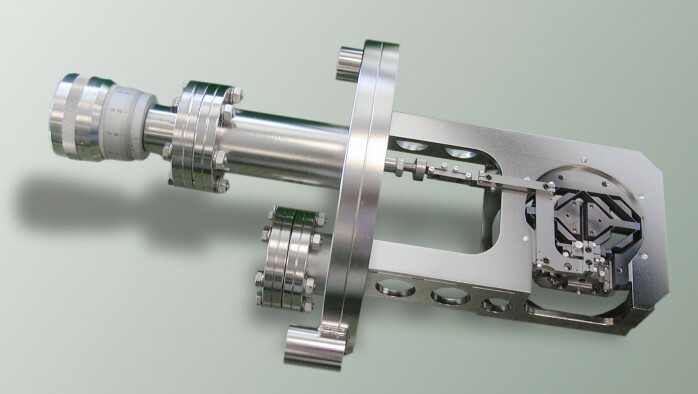 The precision slit assembly is a backlash free spring pivot system allowing an accurate symmetric and parallel opening and closing of the two slit jaws. 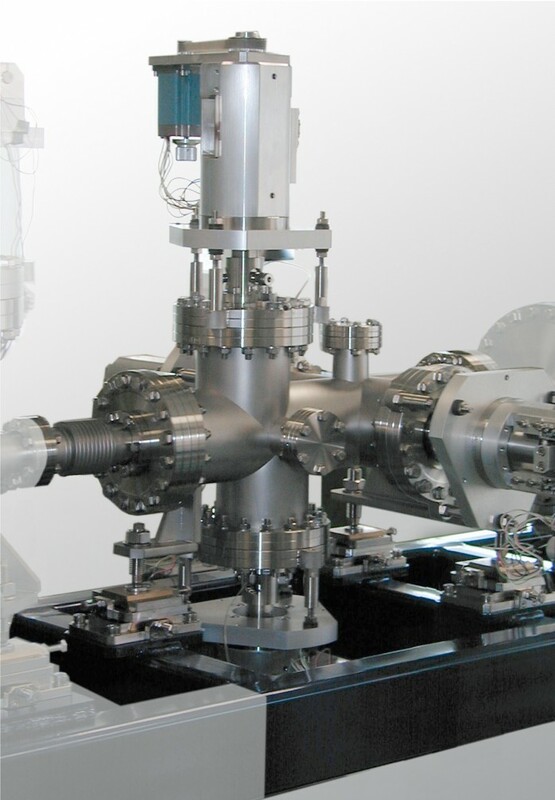 It is driven by one single linear feedthrough. This precision feedthrough can be chosen as manual or motorized type. The motorized type is driven by a stepper motor. 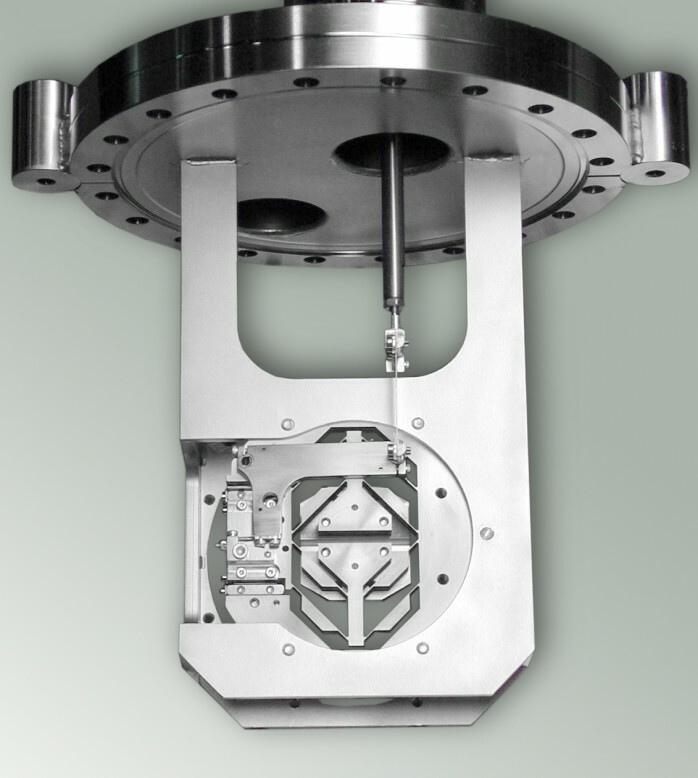 The slit assembly is mounted on a CF150 base flange which has fiducial holes on its air side for alignment and surveying. Water cooling of the slit jaws and / or their electrical insulation for drain current measurements are possible options. 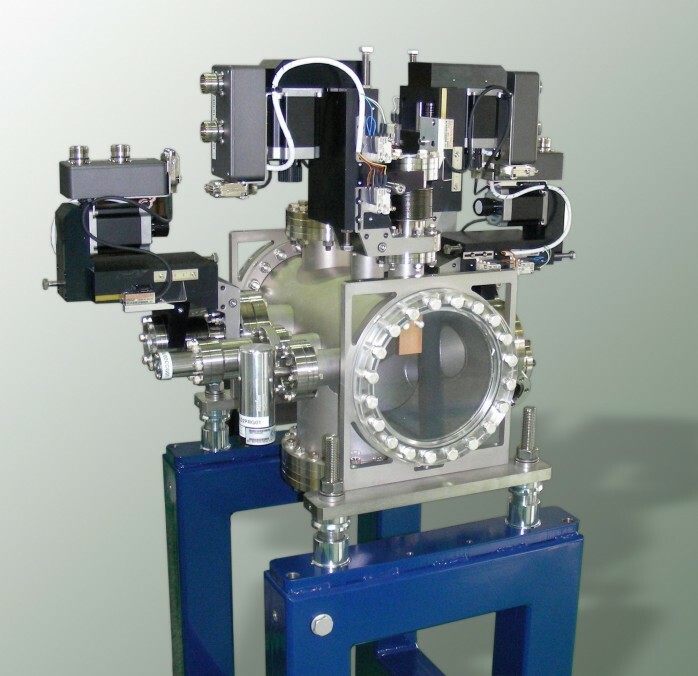 The slit chamber has a nominal size of 150CF and can contain several other ports for a pre-aperture, viewports, fluorescent screens and an ion pump a.s.o.. 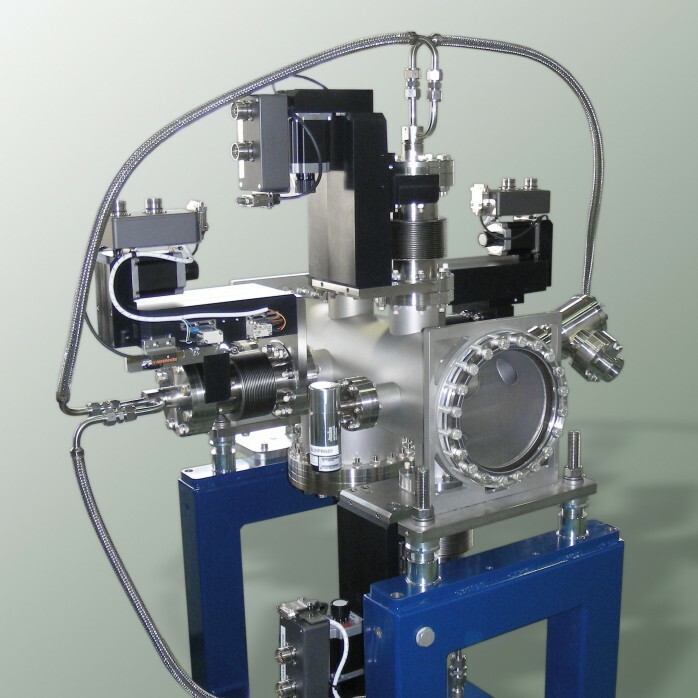 The whole slit chamber can be moved along the beam direction by a manual or stepper-motor-driven precision linear guide system. 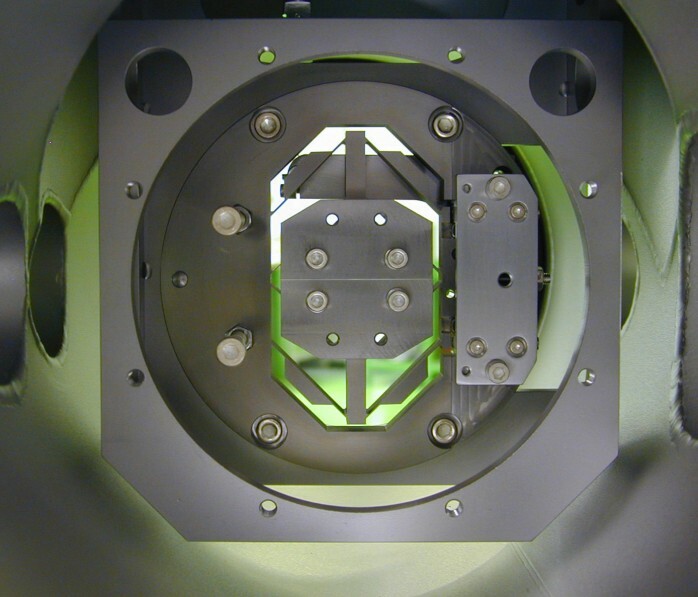 The necessary length compensation is realised with welded bellows upstream and downstream of the slit chamber. The linear guidesystemissupportedbya rigid steelframesupportora block made of concrete or granite. 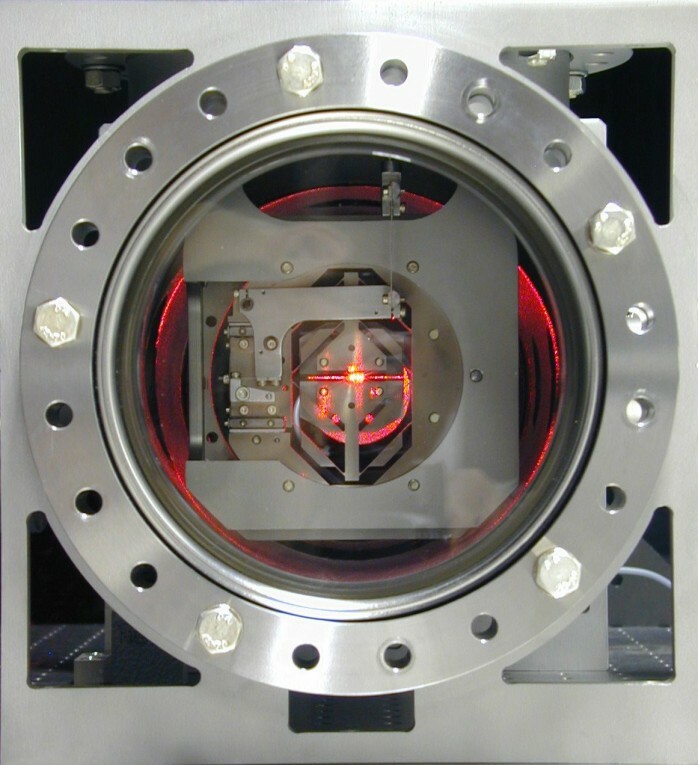 They allow an accurate alignment of the slit system with respect to the beam axis. 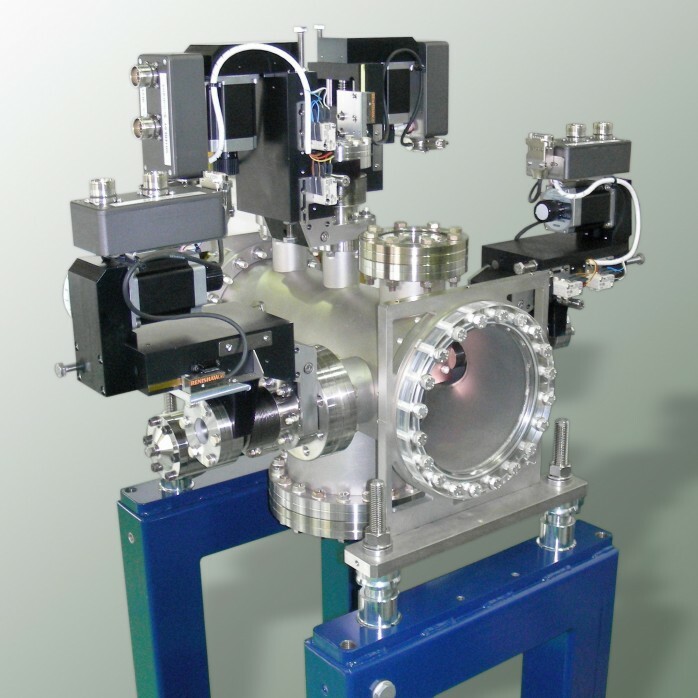 Each system consists of two or four slit heads and manipulators. 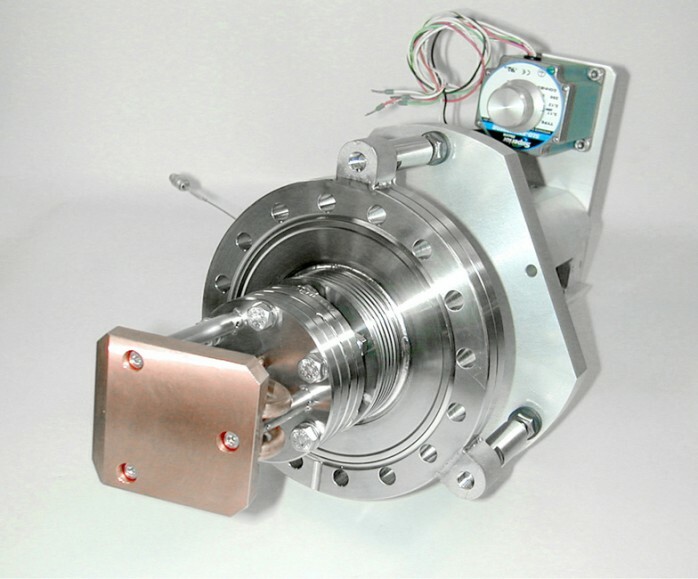 The linear drive system is mounted on a base flange CF100. 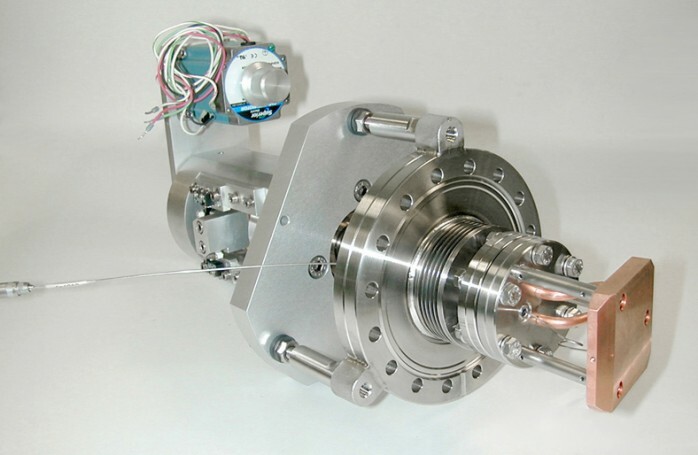 The system can be equipped with end switches, reference points or linear encoders. The linear feedthrough to the vacuum is realised by a welded bellow. 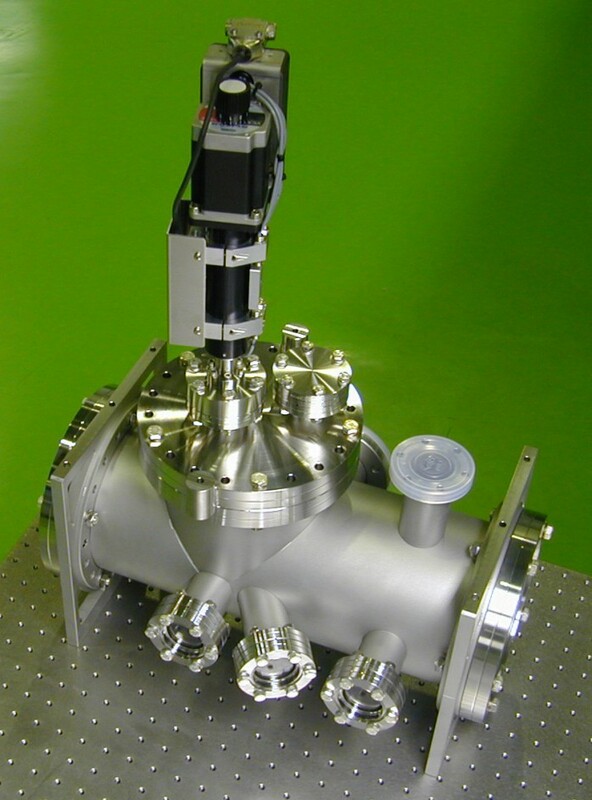 The vacuum side interface for the elements to be moved is a flange CF54. 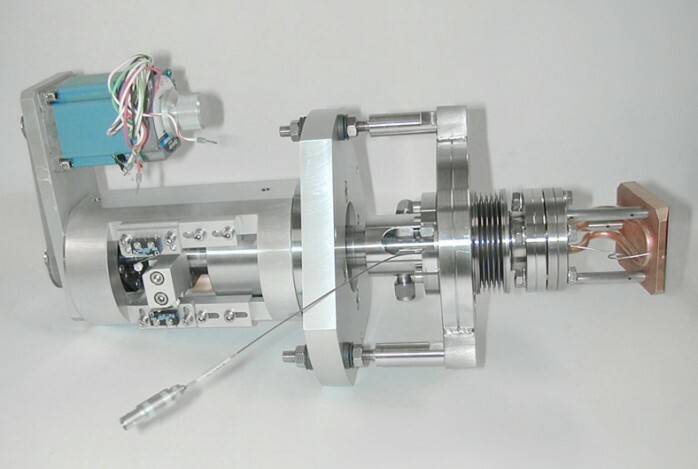 Depending on the heat load and the slit precision various slit heads can be connected to that interface flange on the vacuum side. A standard slit head consists of e.g. 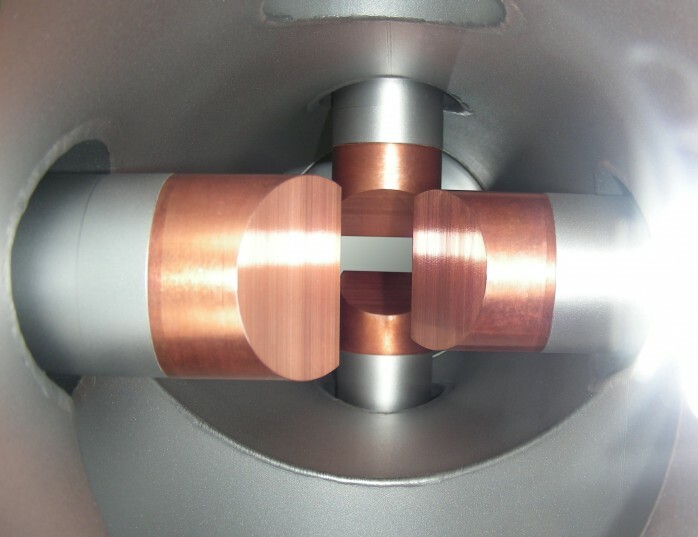 an inclined copper or Glidcop® plate with water cooling on the backside. In case of a high thermal load a tungsten cutting edge is inserted into the copper plate. For temperature control of the slit head a thermocouple can be fitted as an option. 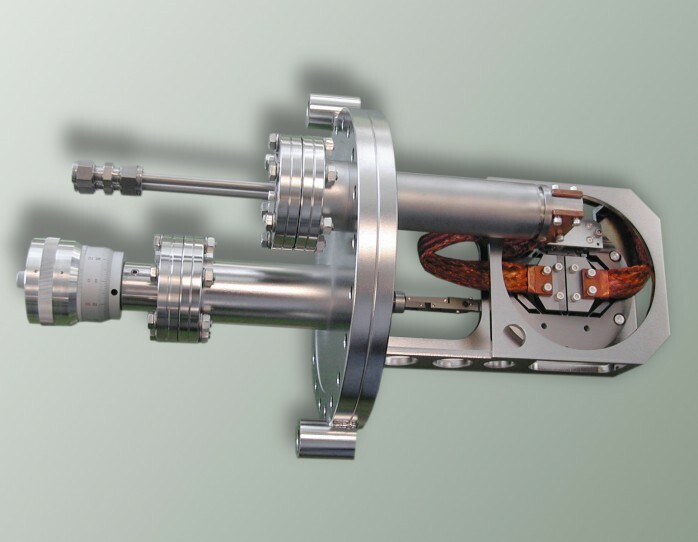 The linear drive system is mounted on a base flange CF63 or CF35. The system can be equipped with limit switches, reference switches or linear encoders. The manually driven or motorized linear feedthrough to the vacuum is realised by a welded bellows (size 63 or 35). 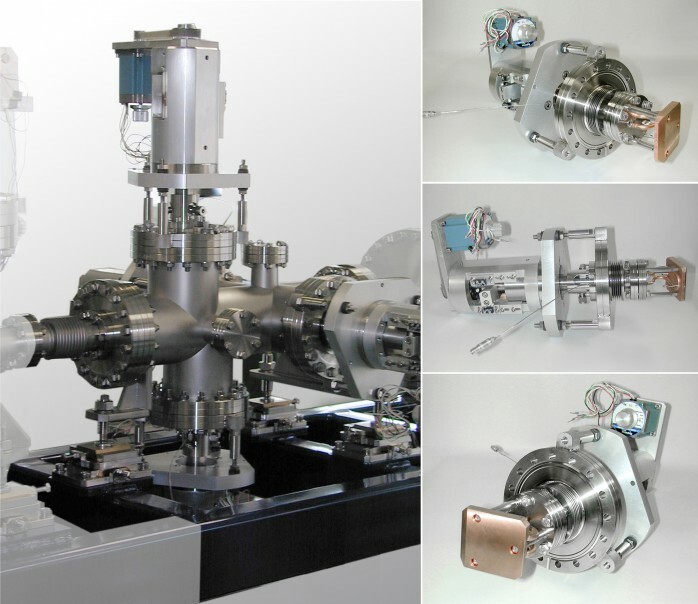 Depending on the heat load and the slit precision various slit heads can be connected to that interface flange on the vacuum side. A standard slit head consists of e.g. 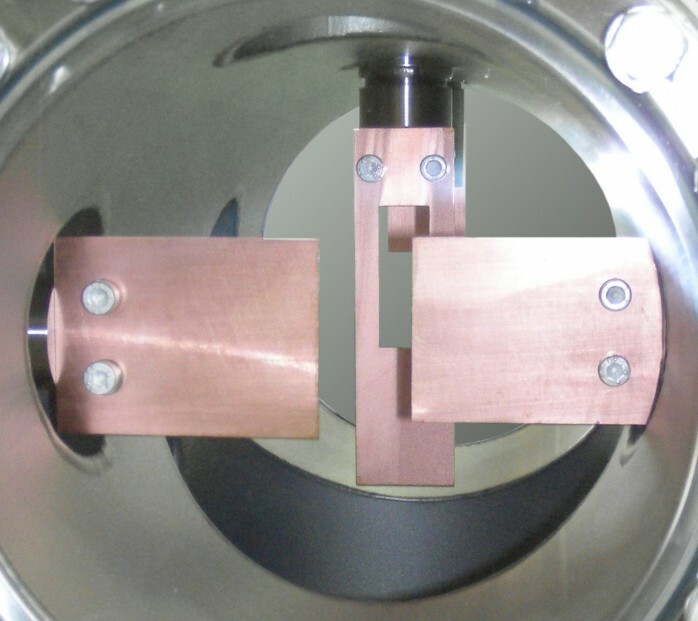 an inclined Copper or Glidcop®plate with water cooling on the backside. In case of a high thermal load a Tungsten cutting edge is inserted into the copper plate. For temperature control of the slit head a thermocouple can be fitted as an option. As an further option FMB offers the drain measurement on the insulated aperture blades.